Flatland: The Movie is a short, educational 35-minute animated film based on an old novel called Flatland. I thought the movie was quite interesting and entertaining, and my husband felt the same way. We both liked watching it. The animations are excellent, the voice acting of the cast is very good, and the whole thing is very well made — thus very enjoyable to watch. 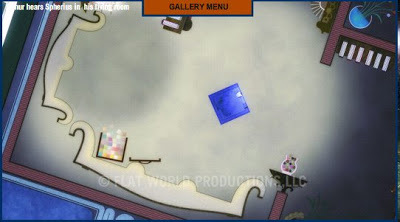 The storyline is set in a two-dimensional world called Flatland. Its inhabitants are simple geometric shapes such as triangles, squares, pentagons, hexagons, and so on. Circles are the evil bosses of Flatland. Arthur hears Spherius in his living room. The main plot involves Arthur the Square who is parenting his oh-so-curious granddaughter Hex. Arthur goes to work in a "squaricle" in some office, and has (of course) a circle as a boss. Hex starts contemplating about the third dimension, but since that is "heresy" and unimaginable in Flatland, Hex's investigations eventually get her and Arthur into trouble. But there is a "savior" — a sphere called Spherius from Spaceland who wants to educate the citizens of Flatland about the existence of the 3-dimensional world. The interactions between these shapes express plenty of irony that makes the film fun to watch for older teens and adults — and can maybe make them think a little deeper about the prevailing "doctrines" that they are fed everywhere. Just like the shapes in the Flatland had never considered the possibility of a third dimension and rejected it as "heresy", even so we ourselves might be in a similar position (concerning something else), without realizing it. I wouldn't recommend this movie for early elementary school or younger children because of the strong emotions expressed by the evil circles. Also, young children might not catch on to some of the main themes of the movie, the irony, nor the mathematical ideas. I couldn't put an exact age limit to this though; is up to the parents to decide, of course. Also, I really liked the extra interview on the DVD which has a math professor discussing the intriguing possibility of a fourth dimension, and some neat illustrations. Apart from the mathematical content, one could analyze this movie's themes (accepting new truth vs. sticking to the current ideology) for an English class project as well. The website FlatlandTheMovie.com has photos, info on cast & crew, news, the trailer, and a store. Amazon.com sells the movie as well. Disclaimer: I was given the DVD of the movie for free to review it. I did not receive any monetary gain from the company, however.